I want that thank you all so much! The responses to my giveaway have been overwhelming. So many of you responded and so many of you left beautiful comments complementing my work. I want to thank you all from the bottom of my heart. It makes all the hard work worthwhile when I read that some of you have been able to make things you thought impossible. 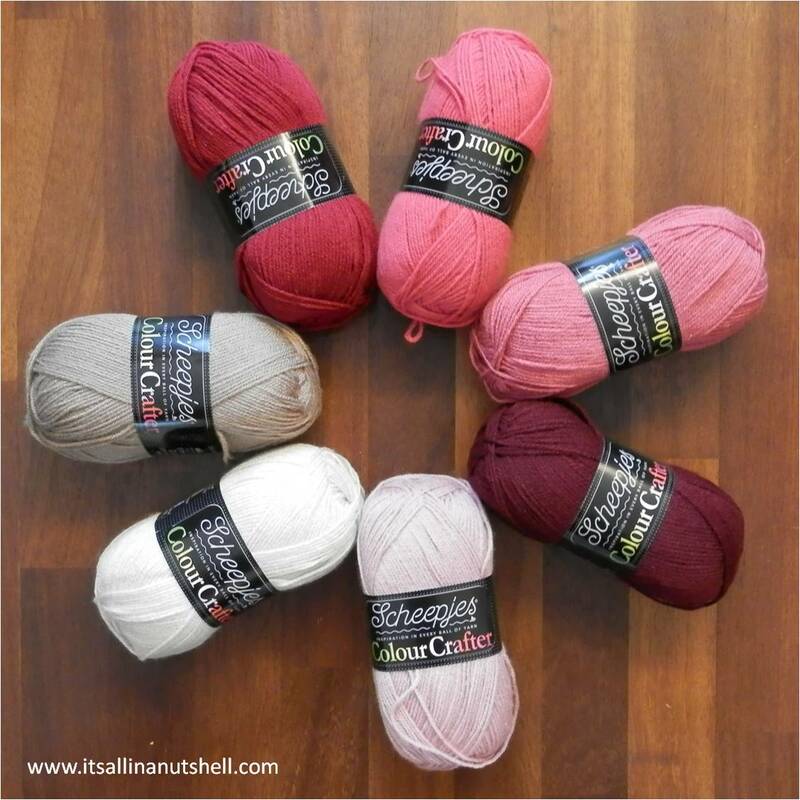 In a short video I showed you the 7 skeins of Scheepjes Color Crafter you could win along with a 4mm Clover Amour crochet hook. Color Crafter is a 100% premium acrylic, super soft, hypoallergenic and available in 63 bright and beautiful shades named after towns in The Netherlands. The seven colors in this giveaway are Tiel (1023), Kampen (1035), Veenendaal (1064), Venlo (1080), Tilburg (1083), Roermond (1123), and Zandvoort (1218). To win my giveaway I asked you to tell me what you love about Scheepjes yarns. You all love the extremely large color range the different yarns come in, the excellent quality of the yarns and that Scheepjes yarns have an excellent price/quality ratio. I fully agree! I have not come across a Scheepjes yarn that is of inferior quality or that has a dull color. It was no easy task picking a winner from the 444 entries. First of all, I want to stress the choice for the winner is based on how the question I posed was answered, but also a bit on emotion. Who spoke to our heads as well as our hearts? At the end I had a short list of about 5 people, I finally asked my husband to make a choice because I simply could not. Happy belated birthday wishes from my beautiful State of Colorado, USA. I have seen so many beautiful items knit and crocheted with Scheepjes yarn and would love to try it. As an old lady, I’m on a fixed income so can’t really try all the yarns others are using. I also use the metal crochet hooks from Walmart so if I win, it would be a double win for me. A beautiful collection of gorgeous yarn skeins and a new hook!!! Thank you for your generosity and all your videos. I have crocheted for 45+ years but the new stitches throw me. Without your videos I couldn’t have made the Sophie and currently the ATB. Thank you for considering me to win. God bless you honey and have a wonderful birthday!! Congratulations Penny! I will contact you to get your address so that I can get your gift in the mail to you. If you did not win my giveaway, but you would still like to have some delicious Scheepjes yarn, you can buy it from many Scheepjes retailers all over the Benelux, or internationally from Deramores, Wool Warehouse, and Paradise Fibers (USA/CA). Congratulations Penny!! 🙂 Thank you again Esther for all that you do! I have learned so much from you. Your voice is well known in my household because I’m always watching your YouTube video tutorials. Congratulations Penny, I enjoyed taking part and look forward to more CAL videos from Esther…Roll on Sunday 😃Thankyou. I am at a loss of words. My head is spinning, my heart is beating so fast and I am just so grateful, excited and emotional over my win. I must find the perfect pattern for this perfect yarn. I so wish everyone could have won also because there were many beautiful entries. It’s going to take awhile for me to really absorb this wonderful win and I wish I could give everyone a hug for making this happen. I love you all and I loved all the entries and hugs to you all. Esther, you are one in a million plus. Without your help and videos and comments on how to do the beautiful pieces designed by very talented craft artisans, I wouldn’t have finished a Sophie and on the current ATB. You are a very special lady and a special thank you to and your hubby!! LOL God bless you all and I will keep you posted………………..
Congratulations Miss Penny!!!!! I am very happy for you & glad you won….. I know you will love the Clover Armour hook….. I absolutely love mine!!!!! Like you, I have never tried Scheepjes yarn….. It will be interesting to see what you think once you’ve tried it…… Let us know…. Again, congratulations to a special lady…..
Now I have tried to keep the tears in but you are all making it difficult. Such touching compliments and they just warmed my heart. God bless you all and thank you.